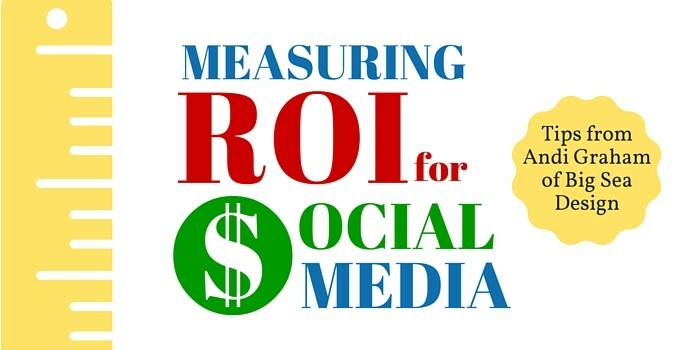 Calculating ROI: How Much Are Your Social Media Efforts Really Worth? Are you gauging your company’s success on social media by counting followers, views, likes or comments? If so, you’re doing it wrong, says Andi Graham, CMO and managing partner at Big Sea Design in St. Pete. Graham recently spoke at FPRA Tampa Bay’s “Measuring Social Media ROI” seminar and shared some great insights on how to better calculate the value of your social media strategy. Lucky for us, Graham shared a specific formula to calculate your social media return on investment (or ROI), but first you need to know what you’re actually measuring. 1. Determine your investment. This can often be tracked by accounting for the cost of your time, the cost of your tools and the cost of any advertising that went into a campaign. 2. Determine (and track) relevant conversions. Conversion metrics may include visitors to a website, leads generated from those visitors, or the number of visitors who purchased something or took a specific action. 3. Back it up to your return. Your return may be measured in number of transactions, number of customers, number of new customers, revenue or profit. To explain the formula for ROI, Graham gave an example using Pin Chasers Bowling Centers. Graham estimated that time invested in the Pin Chasers campaign was 8.5 hours of work per month at $26 an hour, which comes out to $221 per month. Add that to the $41.67 spent on tools each month and the $285 spent on advertising, and you have a monthly investment of $547.67. To determine conversions, Graham reviewed the analytics from Pin Chaser’s website. They showed 4,522 visits to the landing page and 670 form completions to reserve bowling lanes, resulting in 627 actual customers. To nail down her return, Graham estimated the average customer value (based on average sales per customer) at $20 per customer visit. When you consider the campaign brought in 627 customers at $20 a pop, that’s a return of $12,540. With that return of $12,540 divided by the number of visits to the landing page (4,522), Graham calculated each visit to the landing page was worth $2.77. Narrowing it down even more, Graham showed how website analytics indicated that social media produced 762 of those landing page visits. At a value of $2.77 per visit, that means the return from social media specifically was $2,110.74. We know it’s a lot of math, but calculating your real social media ROI is essential for proving there is (or isn’t) value in what you are doing. Rattling off how many Facebook shares or Twitter followers you have doesn’t mean much to the people upstairs who crunch the numbers, but being able to show your actual return on investment in dollars and cents — that’s a valuable asset! Andi Graham is CMO and managing partner at Big Sea Design in St. Petersburg. Follow her on Twitter at @andigrahambsd.